One of the smaller passenger ships that has, on numerous occasions in the past, visited Greenock, is the small passenger ship CLIPPER ADVENTURER. 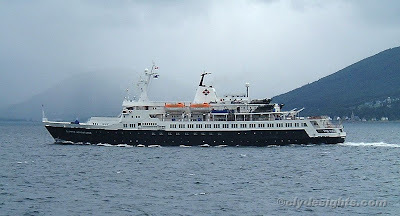 She was built in Yugoslavia in 1975 as the Soviet ferry ALLA TARASOVA, and rebuilt for cruising in 1997-98. With her ice-strengthened hull, she is often found on cruises to polar regions for a variety of charterers, carrying up to 122 passengers. She is 5,750 gross tons, and has an overall length of 100 metres.